The internet of things (IoT) is being heralded as a breakthrough technology that will be instrumental in enabling other next-generation technologies, such as AI, driverless cars and robotics. So far, much of the hype has focused on consumer items like smart TVs and fridges that can order extra milk. But it’s in the business where the IoT is predicted to drive massive transformation. How much transformation? A 2015 Accenture study predicts that the industrial internet of things (IIoT) could potentially increase GDP in 20 economies by a total of $10.6 trillion by 2030. So how can the IoT enable business growth? And what are the costs and potential risks? The first wave of the IoT was mobility: the billions of handheld smart devices that have redefined how the internet is accessed and used. But whereas mobility was about connecting people, the IoT is about connecting machines and devices into a smart grid or ‘mesh’. Sensors embedded in these devices are used to relay real-world feedback to a central controller that can make decisions and initiate actions on behalf of the device and its owner. Retail: The IoT can help automate inventory management in the warehouse or on store shelves. It can also be used to connect mobile point-of-sale devices, detect foot traffic in stores and interact with customers in real-time via their mobile phones. Asset management: The IoT can help transport and warehousing companies better track their vehicle fleets and containers across the supply chain. IoT temperature or humidity sensors could facilitate better climate control for fragile assets, such as food or artwork. Manufacturing: IoT sensors in industrial machines can help detect maintenance issues earlier, reducing repair costs and downtime. Other potential applications include improved parts tracking and better safety monitoring. Healthcare: There are many areas in which IoT devices can contribute to better healthcare, including fall detection, health monitoring, medication management and remote diagnosis. 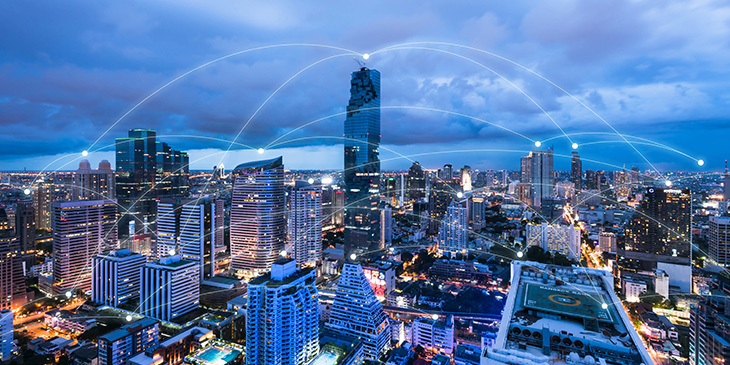 Potential uses of the IoT extend well beyond these examples, with Gartner predicting that more than half of “major business processes and systems” will use the IoT in some way by 2020. How much does the IoT cost? IoT devices are typically designed to be relatively inexpensive and easy to deploy. But they can also come with numerous additional costs – such as the software to run them, increased internet bills and the need to create new business processes. Such costs, however, need to be weighed against its potentially high ROI, which can range from improving productivity and automation to reducing waste and slashing energy costs. Because every IoT device is a potential ‘back door’ for computer hackers, IoT users face significant challenges in keeping their IoT network secure. As an example, cybercriminals were able to shut down the heating in two buildings in Finland in 2016 after performing a denial-of-service (DDoS) attack on their heating controllers. To prevent such incidents, networks need to be frequently monitored for signs of suspicious activity, and security protocols (such as changing passwords on a regular basis) strictly followed. Over the long run, the business benefits of the IoT will almost certainly outweigh its risks. Like any disruptive technology, early adoption is key. If you see a clear advantage to adding IoT tech to your business, don’t be afraid to take the plunge.